And should try looking for it in Omaha. This little cutie (complete with Christmas sweater) was found last week in Omaha, Nebraska, and rescued by the Omaha Humane Society. 1. Who trains a sheep to take walks on a leash? And, more to the point, I didn’t even know that was something you could do. 2. How do you loose a sheep? It’s not like they run terribly fast, like a dog or cat. This entry was posted in FYI and tagged christmas sweater, festive sweater, house sheep, lost, lost sheep, omaha, red and green, sheep on December 17, 2014 by onemilljellybeans. 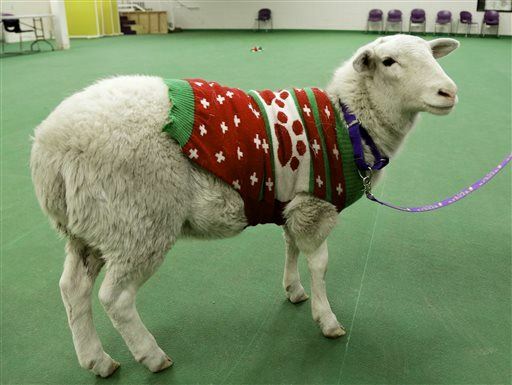 I’m just wondering who thought that sweater was the right size for the sheep? And, do they use the restroom in the house or ask to be let outside? These are important questions! We need to investigate!